KINGDOM HEARTS HD 2.8 FINAL CHAPTER PROLOGUE is the first game in the KINGDOM HEARTS series to launch on PlayStation 4 consoles, and also the first to showcase the new look of the games in Unreal Engine 4. 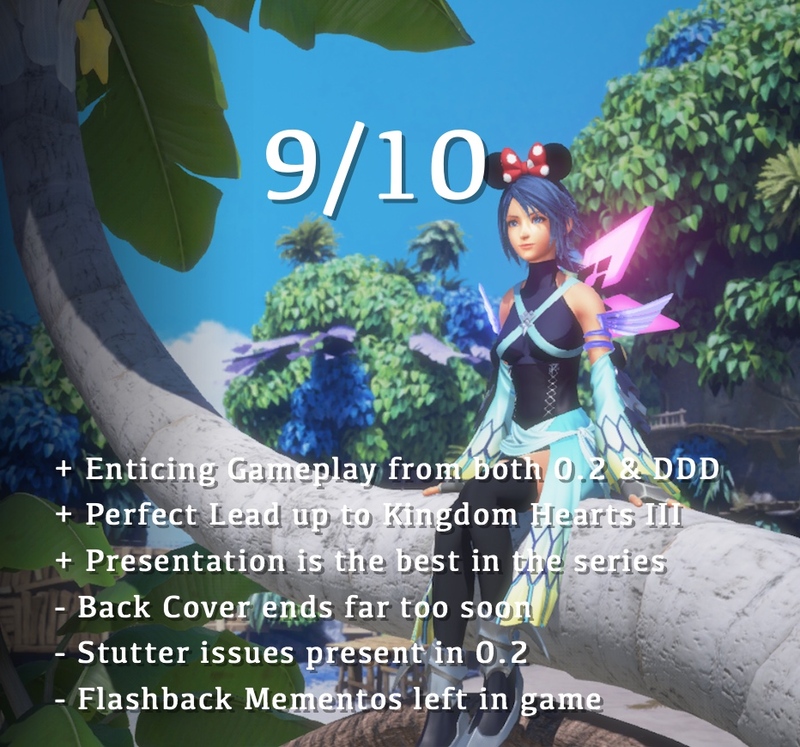 Combining the 5 year old DREAM DROP DISTANCE with the brand new 0.2 BIRTH BY SLEEP -A FRAGMENTARY PASSAGE- and χ[chi] BACK COVER was a smart move as each feature story elements that tie directly into the highly anticipated KINGDOM HEARTS III. I have always regarded the KINGDOM HEARTS series as having gorgeous graphics and stunning environments but nothing could prepare me for just how gorgeous the 2.8 collection really is. In 2012, KINGDOM HEARTS DREAM DROP DISTANCE launched on Nintendo 3DS at 240p resolution and now, five years later, it has been re-released at 1080p with 60fps and it looks and feels incredible. The game has a slick UI, mostly clean textures, and the character models look fantastic. The shining star of the collection is KINGDOM HEARTS 0.2 BIRTH BY SLEEP -A FRAGMENTARY PASSAGE-, which showcases the winning combination of the Osaka team and Unreal Engine 4. 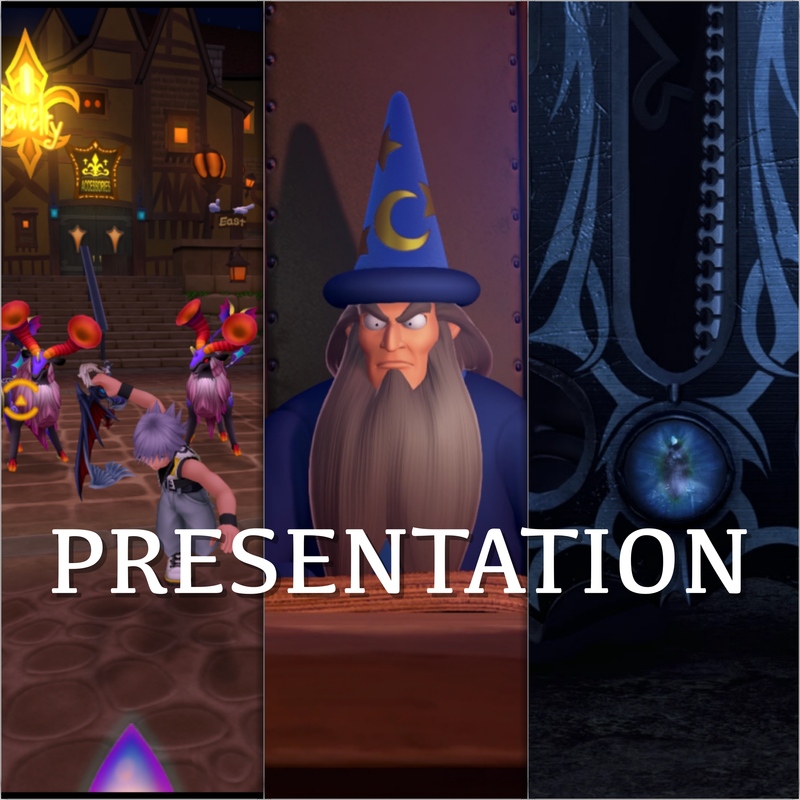 The prologue features cutting edge visuals with responsive gameplay however there are a few stuttering issues that occur during some gameplay moments, such as changing styles or Aqua putting the Keyblade away but hopefully these will be ironed out by the time KINGDOM HEARTS III launches. KINGDOM HEARTS 2.8 also features arguably the best voice work in the series thus far, as the voice actors for 0.2 and χ BACK COVER give incredible performances. Willa Holland and Jason Dohring have improved tremendously since BIRTH BY SLEEP in 2010. All of the new voice actors in χ Back Cover also give excellent performers and it was Karissa Lee Staples’ portrayal of as Invi that ultimately won best voice actor for a Foreteller. Michael Johnston’s Ephemer was a delight to listen to in the short time he was on screen. Ultimately it’s Ray Chase who gives the best performance in the movie, as he sold the Master of Masters sarcastic nature through a humorous performance that was not only captivating but also entertaining. The story of KINGDOM HEARTS DREAM DROP DISTANCE remains unchanged from it’s initial release. We follow Sora and Riku who, after the events of KINGDOM HEARTS RE:CODED, find themselves taking the Mark of Mastery exam. This involves Master Yen Sid sending Sora and Riku back in time to the Destiny Islands before the storm hits (and event that kickstarted the original KINGDOM HEARTS). As Sora and Riku progress further into the Realm of Sleep, they connect with new and old Disney characters and uncover the ultimate plan that Xehanort has been working towards this whole time. The original release on 3DS featured a flashback feature where, after getting to certain points in the story, you are given the option of viewing additional material e.g. after escaping the Light Cycle course you can view a conversation that Flynn and Sam have before Riku came to The Grid. Unfortunately this feature is left in and it feels disruptive to the natural flow of the game. It worked on the 3DS as the game was originally designed for short bursts of gameplay and gamers weren’t expected to sit through 10+ minutes of cutscenes when playing in public. On the other hand it does work with breaking up the exposition heavy scenes that take place in Yen Sid’s Tower, as asking anyone to sit through all of that in one go is a lot to ask for since it’s a heavy monologue with little else going on. In the end, DREAM DROP DISTANCE didn’t really need any additional story added to it, no matter how confusing some people find it. It does it’s job of showing what occurs moments before the start of KINGDOM HEARTS III, which is also expanded upon in the second entry in this collection, 0.2 BIRTH BY SLEEP -A FRAGMENTARY PASSAGE-. It’s only fitting for these to be the first words of KINGDOM HEARTS 0.2 BIRTH BY SLEEP -A FRAGMENTARY PASSAGE-. As the prologue to the highly anticipated KINGDOM HEARTS III, 0.2 has a lot of expectations riding on it. Not only is it a sequel to BIRTH BY SLEEP, it is also a sequel to DREAM DROP DISTANCE, and a prequel to KINGDOM HEARTS and KINGDOM HEARTS III. Confusing, right? Thankfully, the story of 0.2 is anything but. Mickey Mouse begins to recount the story of Aqua who, after saving Terra at the end of BIRTH BY SLEEP, finds herself wandering aimlessly through the Dark World where she happens upon Castle of Dreams. It’s here that Aqua, through a wonderfully delivered monologue, recites the real pain the Darkness can cause. It’s more than just the worlds that get destroyed. It’s the people, the animals, the memories, all of the beauty and everything that the denizens of the world take for granted that gets ripped away from the light. This showcases a new side to Aqua, who has previously been the moral compass of the Wayfinder trio and has a strong sense of duty. Now as she travels across the land, she is full of doubt and unease, with only the visions of Terra and Ventus keeping her going. It’s in Enchanted Dominion that the story really begins to pick up, and the events that follow provide gorgeous visuals and the story starts to connect to the other games in the series. During this adventure, Aqua is joined by King Mickey who fills her in on what’s happened to the Realm of Light. Learning about the issues plaguing the Realm of Light, Aqua has a renewed sense of purpose and confidence in finding a way home. 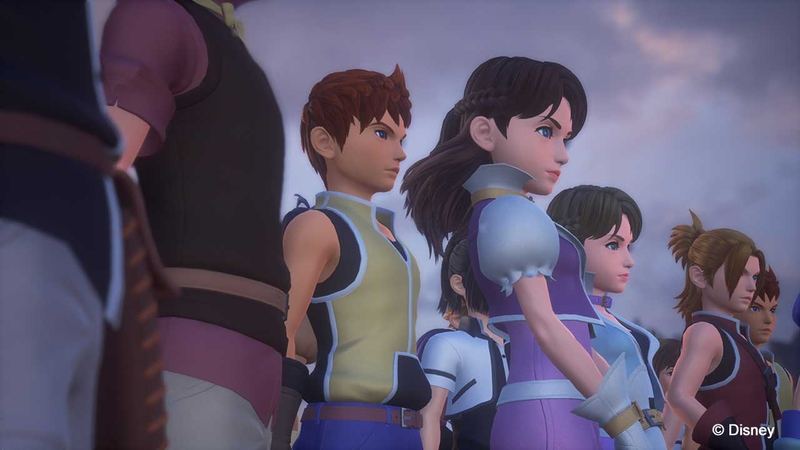 In a game that features a realm full of despair and defeat, it’s inspiring that the story of Aqua ends on something unexpected - hope. In her closing monologue, Willa Holland delivers her best work as Aqua yet and it makes me a little sad that we only got to enjoy Aqua’s adventure for a few short hours. What was unexpected though was the lengthy scene at the end of the credits. For a story that ends with a glimmer of hope, it’s only fitting for the reigns to be handed back to Sora, our cheerful protagonist. In what truly is an exciting cutscene, it is clear how KINGDOM HEARTS III will begin and thinking back it makes me a little sad that there’s still a bit of a wait before we can continue this journey. In the lead up to 2.8’s release, many have looked to χ BACK COVER as an alternative to playing the mobile game KINGDOM HEARTS UNCHAINED χ. The movie does a superb job of introducing this new world, and each character’s personality is distinct and shines through thanks to excellent performances by the cast. As this is part of the prologue to KINGDOM HEARTS III, χ BACK COVER does suffer from being more exposition heavy and hinting at future events rather than focusing on this tale from the past and finding the traitor among the Foretellers. The story jumps over the course of a year, with flashbacks laid throughout the movie to expand upon the connection between each Foreteller and the mysterious Master of Masters. Due to the time jump, many significant in-game events are glossed over and certain characters find themselves omitted from the story entirely. By the climax of the film, it feels like the story is about to go somewhere however, instead of delivering on this, the film just ends, no doubt to entice the viewers to download the mobile app and get the rest of the story from there. It’s unfortunate that it ended like this as I found the story and characters extremely compelling and wouldn’t mind a KINGDOM HEARTS χ BACK COVER Part 2. The gameplay for DREAM DROP DISTANCE has been radically changed from it’s origins on the 3DS. A lot of the touchscreen functions have been remapped to work with the Dual Shock 4, and as such the game feels more responsive and easy to control. One big improvement is the addition of an easy to use camera, which makes the battles a lot easy to control as they often get hectic with lots going on. The command menu has been given an overhaul to support one screen. Three commands are now shown, as opposed to the original two, and you can use the left and right buttons on D-pad to change out Spirits or activate Link Commands. In BIRTH BY SLEEP, the use of the left button on the D-pad was a hot link to one command of your choosing for easy access which has now been remapped to L1. Another change in the system are the Reality Shifts. Previously, you had to swipe down on the second 3DS screen to activate a Reality Shift. You would then use the touch screen to activate the command. This has been remapped to pressing Triange and Circle at the same time. Some of the activation screens have been radically changed or removed, such as the Faith Line shift no longer requiring you draw the lines between the points. The Dream Eater menu has also been updated to accommodate the HD release. From the main menu you can choose to bond, change your party, create new Spirits, or go into the Ability Link section. In Bond, you press Square to activate a menu showing off all of the training toys you have. These mini-games were heavily reliant on the touch screen on the 3DS, however you can now use the touch pad on the Dual Shock 4 or the left analogue stick + X button to move a little hand. The same commands are used with petting the Dream Eaters, a useful action that can provide Link Points and Affection bonuses. Flowmotion is relatively the same as it was in the original release. You can slide into a wall, pole, or Nightmare to activate it and unleash devastating attacks or increase traversal possibilities. Mixing up commands with Flowmotion allows Sora and Riku to take down Nightmares using the full power of their abilities, and it feels good when you get a good streak going. However, it’s easy to lose yourself in the moment and wind up paying for it. Like the original release, the camera is close to the protagonist which means the field of view is small and there can be a lot happening off the screen which can cause devastating results to those who aren’t paying attention or focusing on something else. KINGDOM HEARTS 0.2 BIRTH BY SLEEP -A FRAGMENTARY PASSAGE- is a departure from all previous games in terms of gameplay. It fuses various elements such as DREAM DROP DISTANCE’s grind rails with BIRTH BY SLEEP's style commands and KINGDOM HEARTS II’s command menu into a combat Frankenstein. Thankfully it's a system that works. There’s a lot of elements that can happen when battling Heartless in the Dark World, and each option is left up to the player to decide how they want to progress. Situation commands being an optional element to activate solved BIRTH BY SLEEP's problem of constantly changing styles, and with a lot more depth to this system, you can have a few commands stack up. It feels satisfying to tear the Heartless apart with Firaja, followed by Blizzaja, and with KINGDOM HEARTS III boasting even more magic and abilities, I’m so excited to see where the Osaka team will take things. For a short prologue, there’s also a wealth of content. Between 51 objectives, a new game+ mode and post-game content, such as the Zodiac Treasure Hunt and the Lingering Memory collection, the three hours it takes to complete 0.2 can easily be stretched out to 5-8+ hours. KINGDOM HEARTS HD 2.8 FINAL CHAPTER PROLOGUE had one job - to establish the narrative leading into KINGDOM HEARTS III, and it succeeded. From the revelation of Xehanort’s true plan to what is essentially the very first cutscene of KINGDOM HEARTS III, the game is perfect for both long-time fans and the casual crowd who have been eager for KINGDOM HEARTS III for a long time. Outside of some minor gameplay issues, both DREAM DROP DISTANCE and 0.2 are a great deal of fun to play with hours upon hours of entertainment, and χ BACK COVER is a delightful watch despite some missteps in it’s ending. Disclaimer: KINGDOM HEARTS HD 2.8 FINAL CHAPTER PROLOGUE was reviewed with a digital code supplied by the publisher. I think the missteps of Back Cover was all the hype: seeing the Fartellers' faces, seeing the Keyblade war, Skuld, etc. It don't think anything I said was gonna be in Back Cover which led to the disappointment questions. I think Willa and Jason improved well but people won't give a chance since 0.2 was short and covering the worlds lost in darkness from BBS and KH1. Great review, but I have a point of contention. In 3DDD, you do have the option of activating Reality Shifts with the buttons. It's the same mapping, X+A. "hey i have the game already. feel bad now! mwhahahahh"
Just kidding. Very nice review which makes me even more hyped!! Fantastic review Chaser, though I personally feel that Kevin Quinn as Master Gula was the most entertaining Forteller. His apathetic attitude really sold me on his character, and out of all the Fortellers, he's the most interactive of the bunch. That is actually very interesting, I had no idea you could use the buttons in the original release. What do you mean "bought your copy"? The game actually broke street date in Germany like a week ago. Last time I checked a store (I think it was last Wednesday) for something else there wasn't any 2.8 in the shelves!? It also doesn't really help when you have preordered, lol. Didn't see it as stated above, and I was also at a Saturn, lol. Nonetheless doesn't help since as said I preordered. It's something tasty and it's Austrian, so it fits. Kevin Quinn really made me like my Foreteller. ACTUALLY I personally couldn't stand Travis as Aced because of the Troy Baker effect. Nothing against Travis, it's just that during the end of 2016 I binge-played Telltale's Batman so every time Aced went on a monologue I felt like I was watching Harvey Dent in a mask and it really broke my immersion. It's why I love the relatively new voice actors, I have nothing else to compare them to so I could believe they were those people instead of someone else. If Travis did it like Ray Chase who, despite me spending a week playing FFXV non-stop so I was familiar with his voice, invited me into his role as the Master of Masters and sold it to me as a completely new person instead of just hearing Noctis speak then I would have been pleased but unfortunately I was let down. Nothing against Travis, it's just that during the end of 2016 I binge-played Telltale's Batman so every time Aced went on a monologue I felt like I was watching Harvey Dent in a mask and it really broke my immersion. It's why I love the relatively new voice actors, I have nothing else to compare them to so I could believe they were those people instead of something. If Travis did it like Ray Chase who, despite me spending a week playing FFXV non-stop so I was familiar with his voice, invited me into his role as the Master of Masters and sold it to me as a completely new person instead of just hearing Noctis speak. I think the game was available at real since like the 15th or so, but I really wanted the LE so i preordered it at gamestop instead. Hope it'll be here soon, can't wait. This was beautifully written Chaser; including with the images and videos. Extremely informative about the changes and pros/cons. Fantastic review though did you get to test out the new dream eaters they added? Do they have any new link attacks or limits compared to the old ones or just copy n' paste from a bunch of different dream eaters. I am sooooo stoked for 2.8 though I don't actually think BC abruptly ends to tease the mobile game. I think it ends to tease KH3, I don't actually expect season 2 of Chi to answer any questions about the traitor or the box or the MoM or really anything. It just makes a lot more sense to be a sort of self contained tale about the Dandelions that people don't need to know, but can still enjoy experiencing it (like Rogue One). Because BC does tell us about the dandelions and introduce Ephemera of the Dandelions, so if they suddenly popped up in KH3 people wouldn't be terribly lost so long as they watched BC. The voice acting is pretty fantastic in 2.8 though I feel like everyone is at their best in this game....except Mickey cause while the Mickey VA has gotten better he is still far and away inferior to Wayne. I actually got Catanuki today. Doesn't have anything new with it, but I do like that it turns invisible in battle.